Tim Haskins’ proud and fulfilling career at United Group has officially reached the fifteen year milestone this month. His leadership, work ethic, and attention to detail have played a major role in all phases of development, including: site selection, design development, municipal approvals, code review, cost analysis, and construction management on new projects. Along with more than 30 years of engineering, construction and real estate development experience, Tim’s impressive résumé includes serving eight years in the United States Navy as a Reactor Operator and Electronics Technician. 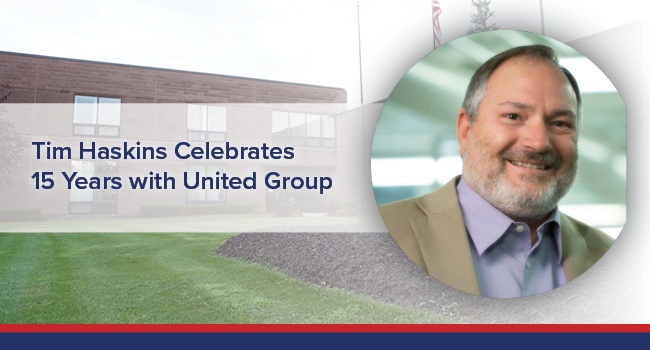 Tim is a key component in United Group’s continued growth and innovation, and we are very fortunate for his expertise and comprehensive skill set. Thank you for your commitment, Tim! Learn more about Tim’s fifteen year career with United Group below! Walter telling me he did not have a use for my skills in this organization and that he would give me three weeks to find a new job. I came over from Earth Alliance, another venture of Walter and Jim’s after we shut it down. I have the same title, and although I still do most everything I did to start, my job has gotten much more involved. Initially I was dealing mostly with design coordination, value engineering and interaction with the General Contractor and subs, and then monitoring the construction of the project. Now I am looking at potential sites, negotiating purchase agreements, obtaining municipal approvals, doing neighborhood meetings, and overseeing the design of the project. I am involved a lot less in the actual construction now. I get to the office between 8:30am and 9:00am. I salute the stately gentleman in the downstairs front corner office as I walk into the building, I acknowledge our American Flag as I pass, enter the lobby and say good morning, check my mailbox, and give regard to Walter’s portrait as I climb the stairs. Once in my office, I turn on my screen, start my music, and grab a cup of coffee and bottle of water. Then it is reviewing and responding to those emails that have come in overnight that are too detailed to view or respond to on my phone. Once I am caught up on emails, I survey my desk for what needs attention first. Look up some piece of information needed by someone else in the office so they can continue doing what they need to do (it has always been my practice to take care of anything someone needs from me first), process design bills so they do not get buried on my desk (Helen hates that! ), review a drawing, review and comment on a market study, environmental report, or archeological report, update a schedule, make a call to push on a project need. I have weekly design calls on each project and keep in touch daily with our architects and civil engineers. When I am not sure what is next, I look at the projects hanging on my wall and review where we are and what is needed. When I am caught up on current projects, I work on potential new projects. Review new land finds, investigate on Google Earth, review surveys and other reports, obtain demographic reports on the site, review municipal zoning regulations to determine what the approval process will be and how long it will take. I do a simple massing study in AutoCAD to see if our projects will fit on the site. Promptly at noon, I stop and walk into Tom’s office and shout “going to eat?”, we then go to lunch and talk mostly about our daily life and projects at home. Then back to the office for the second half of the day, meetings to review project finishes, schedule updates, plan reviews, etc. I try to get out of the office by 5:15 because my wife and dog are at home waiting on dinner with me. We were still at 80 State Street. We were working on approvals for Hearthstone Village. I was involved in working with the architect and civil engineer, but I was not handling approvals. We had this big meeting at the Town of Colonie to review engineering comments on the civil engineering plans. The list was extensive and I was paying attention to what the town said would be required in revision and time to review and approve. When we got back to the office, everyone on the team was thinking how well the meeting went and were pushing for a closing in a few months by year’s end. I spoke up and said, “Wait a minute, I must have been in a totally different meeting than all of you. From what I heard, we are not going to get these changes done and approved for another 6 months,” or something to that affect, and then I explained what I had heard and what it meant. The United Group is family. It has been that way from the beginning. It is not just a job, or a career, it is a group of people who truly care for each other, working together to create thriving communities where nothing existed before. That is what has kept us together through the good and the bad for all these years. 6.) What advice do you want to give yourself now, after working for the United Group during for past 15 years? Fifteen years is a long time, but it’s passing is no time at all. Make the greatest impact you can going forward, because the time is short.